The practice in itself may be healthy, but what about the gears you use, specifically your Yoga Mat? Are you using the kind that’s made from PVC? You get high-quality, comfortable and durable Yoga gear which can transform your sessions, without the toxic fumes. You buy from a company that cares for the environment and shows that with their zero-waste emission-free manufacturing process. You help protect the environment by purchasing and using recycled, recyclable products that reduce pollution. You ensure that your Yoga practice is 100% healthy and good for you AND Earth! Manduka is already a leading brand among Yoga aficionados, thanks to their excellent range of Yoga gear. Their quality products not only help elevate the experience of serious Yoga enthusiasts, but also present a great incentive for more people to get involved in this highly beneficial activity. What sets Manduka apart is their concern for the environment. It’s not only about profits. They are focused on adhering to the highest standards of sustainability and doing their bit to make the planet Earth a better place. While leading by example on the green front, their products routinely provide a more comfortable experience overall for those who practice Yoga on a regular basis. 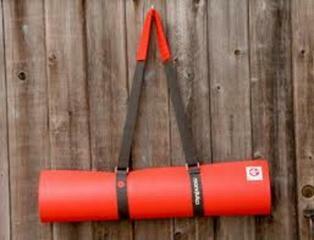 Manduka sells high-quality Yoga mats and gears, commonly used accessories for serious practitioners of Yoga. Having the right accessories adds comfort and relaxation to the mix. Mats – Manduka has a wide range of Yoga mats on offer, which are manufactured using closed-loop processes and do not use any toxic dyes or chemicals. These mats are recyclable, and are especially made for enhanced durability and comfort. Towels – Made with material gathered from recycled plastics, these durable towels provide great performance while providing the company with a great way to repurpose plastic waste. The towels are hardy and can withstand years of rigorous use. Bags – The sturdy, spacious Yoga bags are made from recycled material and can be used for different purposes. Manduka recycles different kinds of recycled waste and uses them as the base material for these bags. There are no toxic chemicals involved in the manufacturing process, and the bags can be recycled after a few years of use. Other Products – Manduka makes a plethora of other products like blankets, straps, sandals and water bottles, all of which are manufactured using the same green processes they implement with their mats and bags. Manduka takes great pride in what they are doing, and their message of love and unity is inspiring in the way it communicates their intent in preserving the environment and being a force for good. Their aim is to nurture the planet and develop products and processes which are sustainable in the long term. Manduka is committed to making planet Earth a better place, one step at a time, while providing high quality products that can help people’s mind body and spirit. We are so used to PVC materials around us that we have taken their negative effects for granted. Everyone’s using it, right? Well, not really. Serious yoga practitioners are now veering away from PVC mats. They realized that while cleansing their minds, they’d prefer to not inhale the dioxins released by PVC. PVC is being called one of the most hazardous material ever created by man. Yes, it’s cheap and does its job, but it’s also toxic to humans. The material is being banned in many countries. Aside from being toxic, it’s not biodegradable or recyclable. So, when you throw your PVC mat away, it will stay in our landfills for a long time. Many companies around the world have taken it upon themselves to prioritize their social responsibilities, and the result has been a concerted corporate drive to adopt sustainable process. An increasing number of customers are looking for eco-friendly products, and businesses are giving them what they need. One such company, which has been doing an exemplary job of creating great products while contributing to the maintenance of the environment, is Manduka. They’re one of the best manufacturers of eco-friendly Yoga gear. The company is an inspiration for many when it comes to nurturing the dream of a better, cleaner world. Yoga is an activity that many people practice, and its benefits have made the lives of people better for centuries. Apart from its obvious physical benefits, Yoga also has considerable calming influence and helps people relax while improving focus and concentration. For a comfortable and efficient Yoga experience, there is always the need for high-quality, sustainable Yoga products. Manduka is committed to making planet Earth a better place, one step at a time, while providing high quality products that can help people’s mind, body and spirit.